Your dream car has come to reality by Porsche. 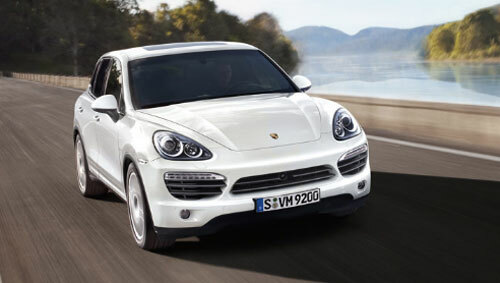 The 2011 Porsche Cayenne is the latest car you would love to have on your collection. It is a five seat mid-size luxury crossover built on the platform developed by Porsche and is a joint venture of the Volkswagen Touareg and the Audi Q7. It has a history of three generations with chassis Type 955 (2002–2006), Type 957 (2007–2010), and Type 958 (2011 onwards). 2011 Porsche Cayenne is an extraordinary all-rounder manufactured to give you a real cruising experience. 2011 Porsche Cayenne boosts an elegant and stylish exterior with sturdy chassis. An air suspension system features self-leveling and ride-height control. The Suspension with steel springs and Front and rear stabilizer bars gives support to the car. Double wishbone front axle and multilink rear axle not only adds to the exterior but also enhances the outlook. Porsche Active Management System, PASM has three setup modes: Comfort, Normal and Sport that supervise the body movement of the car. Tail lights, brake lights and side marker lights with LED technology give the car an impressive look. The electric slide/tilt moonroof has a manually adjustable sunscreen and remote closing function displaying a magnificent exterior. An amazing driving experience is possible with Porsche Traction Management (PTM) which gives all-wheel drive capability to the car. The 3.6 liter V6 engine gives outstanding output power of 300 hp @ 6,300 rpm .The Direct Fuel Injection DFI injects fuel directly into the combustion chamber. The new eight-speed Tiptronic S Auto Start Stop function automatically starts the engine. VarioCam Plus gives the functionality of two engines i-e one for normal driving and another for performance driving. The six-speed manual gearbox gives more control on the cruising. Top Track Speed of 142 mph is achieved with an efficient fuel consumption and impressive mileage of 22mpg on highway and 15 mpg in city. 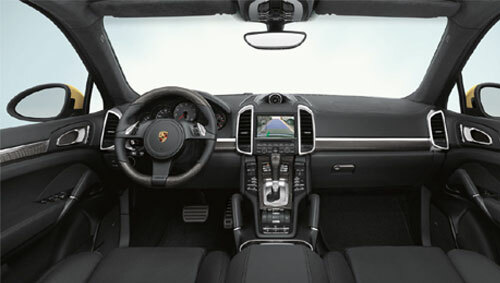 The spacious interior of 2011 Porsche Cayenne is equipped with seats trimmed with grained leather, electrically operated 12 way seats in front, and 4-way lumbar support adjustment. The refrigerated glove compartment and integrated cup holders in front and rear gives you convenience. Chrome-plated tie-down eyelets in cargo area and a rear bonnet with a total volume of 23.7 cubic feet can accommodate up to 6 suit cases. Spoke steering wheel with colored Porsche crest gives enhanced cruising control. It also has a roof transport system with roof rails in Aluminum blend that makes your Porsche Cayenne ideal for long trips. 2011 Porsche Cayenne offers incredible safety features with ABS 8.0 Anti Lock Braking System and Brake Assist. Full size driver and passenger Advanced Airbags and child safety (ISOFIX) technology provides passive safety. Anti theft Vehicle System protects your car from being stolen. 2011 Porsche Cayenne is light on your environment with Environment Friendly Technology. The reduction in vapor emissions is made possible by non-return fuel supply system. The twin oxygen-sensor circuits give effective emission control. It is entirely free from asbestos, CFCs and components manufactured using CFCs thus, making it a greener car for your environment. 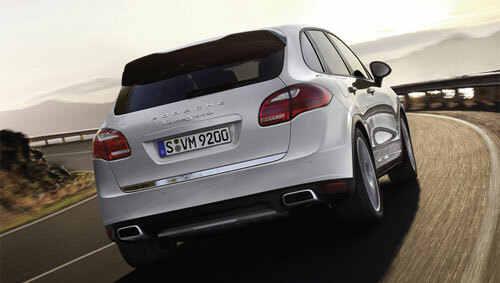 So, Order your 2011 Porsche Cayenne now and cruise the world in a new style.